How To Publish A Poetry Book, Chapbook, Or Collection Of Poems - Writer's Relief, Inc. 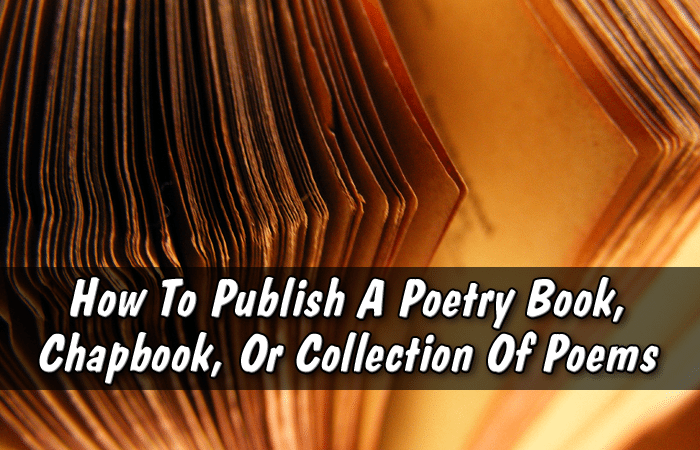 If you’ve written so many poems that you’re interested in publishing your poetry as a book of poems, as a chapbook, or as a collection of poems, there are a number of ways you can get a book of poems published. But before we tell you how to publish your poetry manuscript, there are a few things you should keep in mind. First, poets approach Writer’s Relief every day asking us how we can help them make money on their poetry. The unfortunate truth is that it’s not very likely you’ll make a significant amount of money by publishing your book of poetry. Traditional, big publishing houses typically do not publish the work of unknown or moderately known poets because there simply isn’t a large audience that is willing to plunk down money for poetry. And because there’s little money in poetry, literary agents tend not to represent poets (with the exception of the very famous). So that’s the bad news. But the good news is that poetry writers now have a strong alternative to the big New York publishing houses—self-publishing their own work!. If you’re interested in having total control over the process and product of publishing your poetry collection or chapbook, you might want to consider self-publishing. Especially if you’d like a way to easily share your poetry with your family and friends, self-publishing is a good option for you. Having to take on all the tasks involved in self-publishing your poetry book may seem daunting (and even a little scary! ), but skilled professionals like those at Self-Publishing Relief can guide you through every step of the process. Also, it’s best to have a solid list of publication credits for your individual poems before you consider self-publishing your poetry. Enter chapbook contests. If you’ve amassed a collection of poems that might not be long enough for a full poetry book, you may want to consider entering a chapbook contest. Although the rules vary, chapbook contests generally want between 25 and 60 pages of poetry. Most chapbook contests are sponsored by universities or small presses, so while there may be an entry fee, there is also usually a payout for the winner in the form of publication and a monetary prize. If your poems are very strong, entering chapbook contests might be a good way to get your poetry chapbook or collection published. Approach small presses. If your collection of poetry is too big for a chapbook, you may consider approaching small presses (independent publishers) with your poems. To do this, you’ll need to have strong publishing credentials. You can learn more about how to get publishing credentials at these links: Building Publication Credits and No Publishing Credits? Get Publishing Credentials: How To Build Up Your Writing Bio Super Fast. Universities and small presses are the heart of contemporary poetry, so do the proper research and send your queries their way. Many poets are competing to publish their poems as poetry collections or chapbooks. Even though there isn’t a strong mainstream market for poetry, the opportunities for self-published poetry books in independent markets are growing. In order to keep publishing markets open to poets everywhere, consider subscribing to literary magazines and journals, or consider supporting the work of other poets who are self-published. To build more lucrative publishing markets for poetry, read and buy more poetry. If you’d like help building up your poetry credentials, Writer’s Relief can help you develop a strong submission strategy to publish your individual poems. Our clients publish regularly in the literary magazine and journal markets. Visit our Overview of Services for more information. QUESTION: Mainstream readers tend to shy away from poetry books. Have you ever purchased a collection of poems by a single author? Leave the name of the book as a comment! HI my name is Nishith and I have written a 400 page poetry book recently, but I do not know how to go about publishing my writings. I do not have any experience or knowledge regarding book publication, printing, or distribution. Does anyone know where or to whom I could confidently send my work to for publication consideration? I do not know who to trust, or to whom I can even send a large amount of my writings to. It has been my lifelong goal and dream to publish my very own book of poetry which I have written by myself, and I am finally ready to move forward with this, as I just very recently completed my book. Thank you for your help. I have purchased every book Kahlil Gibran wrote. I think it is about thirty. His book The Prophet is still a good seller. I often by used ones just to give away. Hello,I want to publish my poems how will I go about it? Can I get an editor to help me edit the poem? Hello, I am Madhav Chaurel from Nepal. I want to publish my Nepali poem collection. I talk some publisher on my country Nepal. They say me that we are published but you paid all expenses and duties for press and marketing.And they ask to paid Nrs. 100,000 (US$1000)for the 1000 pics books. I have no money to paid this. It is my dream to published my poem collection book. Can I any help for me? Hello there! My name is John Sekolo in Lesotho. I am a poetry writer and am working on my poetry book and am struggling to publish this book. How can I be advised to get this book published? I really love writing poems. I believe that writing poems is an easy thing that everyone can do rather than just sitting. Thank you for your inquiry. When you have some time, please browse the Writer’s Relief website for interesting and informative articles for authors. I am sending you a link to our publishing toolkit that I hope you find helpful. I’ve recently turned 18 and have been writing poems since I was about 12 years old. I haven’t let many people read my poems, outside from my immediate group of friends, because they’re personal. I have become more and more comfortable with sharing my poems and letting people read them, since I have learned of the impact they have made on my friends. Where do I start? Hi there! I have a blog where I have posted over 300 pieces of poetry and have a very strong following, like in tens of thousands. Can this help me in securing an agent, since the blog shows that people accept and like what I write? I want to publish my work, I just don’t know the right way to go about it. I know that self publishing is an option because I already have a good database of readers. But does traditional publishing provide some kind of edge over self publishing? Should I still try to get my poems published in a journal before I try to go all the way? Do I still need an agent, and how to find one? Hi! Last year I entered into an agreement with a publishing house to publish a collection of my poetry. Accordingly a book was published . If I now want to self-publish those poems , can I do so? Would there be any copyright issues? Before publishing your poem in a literary magazine, do you need to get your poem copyrighted? Or will it automatically legally be yours once published in a literary magazine? I’m not exactly sure how this works, and I want to make sure none of my poems get stolen. Thank you! Thank you for your blog comment. As we mentioned in our blog article, it is extremely difficult to publish a collection of poetry. It’s best to have a solid list of publication credits for your individual poems before you consider approaching a publishing house or self-publishing your poetry. If you’d like help building up your poetry credentials, Writer’s Relief can help you develop a strong submission strategy to publish your individual poems, unfortunately, you must be 18 years or older to use our services. Keep us in mind for the future, in the meantime, keep practicing and improving your writing. Don’t give up! Getting published is difficult, and you are likely to see a lot of rejections on your journey to getting published, but it is possible. Hi! I’m a person from India. I’m into writing. Recently I’ve written tons of poems which I’m thinking to publish as ‘a collection of poems’, but I’m very young and have zero experience in publishing and also no knowledge. The collection that I’d like to publish contain poems that are about topics that are somewhat linked to each other. So is it a good idea to publish that kind of poems together? Also, is it realistic for a young girl like me to think that I’ll someday even publish my poems? Do reply, thanks! Thank you for your blog comment, unfortunately, our primary focus is on American markets. We target American literary agents for books and mostly American markets, and some overseas publications that accept submissions in English, for short prose and poetry. Therefore, we can only work with manuscripts written in English. Thank you for your comment. You would need to check the submission guidelines on every agent or publishers site. Every agent/publisher is different, but they usually mention in their submission guidelines whether they are willing to accept simultaneous submissions. Best of luck! Absolutely! Adding conferences attended to your bio is a good way to let editors and agents know how serious you are about your writing. Good luck with your bio and chapbook! Is it alright to send your collection of poems to multiple publishing houses at the same time, or does one have to wait for a reply from one publication house to approach the next one (in case it is rejected) ? I’ve published a few poems in literary journals and have included those in a larger collection I’m putting together as a chapbook. I did submit the chapbook to several contests with no luck. Recently I submitted an application to the 2016 Breadloaf writer’s conference and will hear if I’m accepted by the end of May. Is attending a well known writer’s conference such as Breadloaf a good addition to one’s bio? Gary, Try our Free Publishing Tool Kit on getting published! I do energy work, my work has the power to shift people, to give them Hope, to inspire to great things, I am going to change the world one Heart at a time. I need to find a way to get this to other people, if any money was to come to me through this effort that would just be a side note. Do you have a suggestion for just getting my poetry to more people without regards for making a profit? thank you, Healing Star, I’m here to remind you, of just Who the Hell you Are. Kari, we see chapbooks average to about 20-30 pages, while much longer poetry collections tend to be 50 pages and up. As far as your publication credits, any that you have is good to mention in your cover letter. It might be hard, but we wish you good luck towards publication! I am actually working on putting a book of poetry together. I was wondering how many pages is the average poetry book? My book will contain, poems, maybe some pictures and narrative…it will be a mash up of all I do as an artist/writer. I have had two poems published in two different books that were published through poetry contests. I’ve had some awards for my art work but I haven’t submitted any narratives to anything. Is this enough “publication” to actually achieve what I want to do? Yes. As long as you retain all rights to your work, there are traditional publishers who will consider publishing your collection after you have self-published it. I’ve been writting poems since my teen years…but have rather prefered piling them up since I’ve not been chanced to publish. Recently though, I have started writting actively and planning to self publish. But my question is that, if I self publish and retain all publishing right, can i still approach a traditional publisher…. Rana, the publishing house would only own the 22 poems that they’re publishing. So, if some of those poems include song lyrics, then theoretically they would own them, too. If you choose to opt for self-publishing, try Self Publishing Relief to guide you along the way. Hi..this has been really helpful but i still do ve a question. I am getting my 22poems published in a book but the thing is that these poems are also my songs lyrics..so if i get them traditionally published would the publishing house own my songs lyrics too ..it would..wouldnt it..? So should i opt for self publishing? Sure it’s a great idea. However, you’ll probably need to cut it down to between 48-99 pages. This is usually the standard for chapbook contests. Well if someone like me who has been published by alot of magazines and I have career as a greeting card writer.I am thinking about getting a collection of poems published I have written over 600 poems.do you think it is a great idea. Congratulations on your publishing success, Jackie! Short chapbooks are 18-40 pages long, whereas standard poetry collections are 45-90 pages long. It’s better to have published as many individual poems as possible before you approach presses. If you want to go the self-publishing route, then your existing credits are probably just fine! I have a good track record of publishing single poems in established literary journals. Should I shoot for a chapbook… or wait another year or so until I have enough for a longer collection? Or, do both? I don’t want to be redundant, so I’m thinking I should wait. On the other hand, I’m getting really old! A collection of Arthur Rimbaud. The Wasteland. Howl. I’m interested in publishing a collection of original free verse, primarily in ebook format. Any suggestions would be appreciated. Are there any recommended small publishing companies for poetry collections? I’ve found most articles online tell you to look for publishing companies a lot, but never straight out tell you which ones are good and which ones are scam. LOL! We’re sure there have been poets who have sold their work on the street corner before, but generally speaking, we encourage writers to go the tried and true route of building an online author platform to promote and sell their work (e.g. creating an author website, being active on social media, etc.). I am amazed that answers to poetry questions are actually answered here. I find that compelling; as well as, the many questions that were answered. My question is: Do poets ever make their own chapbooks and/or poetry books from start to finish, then stand on a street corner (say in Seattle) and beg for donations? Is this proper? I am working on a million reads. Even if, I got a quarter a poem, I could say, I am a professional—now. lol My bio on Twitter used to be: Nurse for money. Poet for free. I am Candace Heartunes there. I guess the worst that could happen on a street corner is getting mugged for my poetry…like yeah, man! I love poetry. Thank you for this informative place I just found. I enjoyed reading Shel Silverstein books growing up, and fell in love with the whimsical yet occasionally morbid stories he could create with mere sentences. Poems I enjoyed in college were “Not Waving, But Drowning” by Stevie Smith and “To an Athlete Dying Young” by A.E. Housman. These are pretty popular it seems, and for good reason. Let me share you that i have composed many poems in classical style as i prefer it to modern. I can also write in modern style as i embarked writing a novel too. My translation of an Arabic classic work is already over. Let me guide me to get a good publisher to do all these as good as possible. Yes I have! ‘Auguries Of Innocence’ by Patti Smith. Pablo Neruda. Love Sonnets in English and Spanish. Tom, if you’re looking to publish individual poems, the best plan to do that is to submit them to literary and online journals, or contests sponsored by them. We recommend that you check out our classified pages here (http://client.writersrelief.com/writers-classifieds/). However, they have to be unpublished poems—that means, they can’t be published online. If you want to self-publish them in a collection, then that’s fine. We recommend you check out our author platform tool kit here (http://www.webdesignrelief.com/author-platform-tool-kit/). Hi I am new to the publishing side of things, been writing poetry since I was a young lad as this was my only means of expressing myself. A very good constructive way indeed, moved onto rapping and creating lyrical poems to sing but only for fun. I love writing poetry but I am just unsure who, what and how to move on to the next step. I have posted a lot of my work on a website called ” the writers-network ” just to have feed back and others views on my work. I have surprisingly received a lot of positive feed back and good ratings for my work, would this be creditable in the publishing world as self published ? and what advice would you give me to take the next step ? I am currently putting together my first chapbook from reading in comments that this be a good idea. Thanks for your time. Congrats on those publishing credits, Mike. It’s actually a really good idea to have previously published pieces in the larger collection; we encourage our clients to make sure at least 50% of the poems that they plan on putting in their collection are published before they send it out. Just a quick question: I’ve been sending work out to be published, and have successfully been published a couple of times, though nothing major. My goal is to publish a collection within the next couple of years and so, I was wondering, are poems previously published suitable for inclusion in a larger collection? Or will large publishers, like the small contests and publications I’ve been submitting to, require previously unpublished material? The poetry book in front of me now is The Owning Stone, by Jim Peterson. Erica, great question! It’s wonderful that you’re honoring your friend’s work with posthumous publication. As the author of the poems, your friend would indeed be listed as the “author” of the book. You and the remaining members of the group would be able to list yourselves as editors (“Edited by…”) of the book. Of course, if you are also including some of your group’s own poems, then whoever included poems would also be listed as an author. Otherwise, “Editor” would be the proper title. Good luck! A group of five (members of a Writers Club) would like to self-publish the poems of a deceased member of the club. Can we list her as the author of the book? And the members of the club for collecting and creating the book? Hi I love to right books I have tried to find somebody who will publish my books i have 2 maybe 3 going right know but I when I work on them I work with friends because in some of my stories the people that are my friends or siblings are based on them there my BFFs I’m only 12 started working on my books when I was 10 I love to write its 1 of the best things that happened to me. 1. Your work is strong, and other people want to read it! It has been previously published, after all. 2. Fans of your older, published work will want to purchase this collection to see what new pieces you’ve written. In short, it’s really best to at least send some of your individual poems out, even if they are not accepted. It gets your name out into the writing world, and some editors may be kind enough to offer suggestions if they do not feel your work is “right” for publication. Hope this helped! Is it absolutely unreasonable to expect your collection of poetry to be published by a publishing house if you have not submitted individual poems anywhere before that? I think I shall look into singles and possibly a chapbook. Honestly, I don’t want to make a cent off of my work. I want the satisfaction of knowing that people around the World are reading something I wrote. Breaking even would be nice, however it is not a must. Hi again, Jo. You would normally let the journal know what image your poem is referring to when you’re submitting it, but general inquiries, such as whether or not images are included in the journal itself, should be asked before you submit. If possible, it’s also a good idea to acquire a sample version of the journal. That way, you can see exactly how the poems are displayed and whether or not images are included. Some journals offer these for free, while others offer them at a discount. Does that mean that you would contact them and ask *before* submitting or would you mention it when you submit? I have looked at the guidelines for the particular journal that I’d like to submit these particular poems to and it doesn’t mention anything. Anyway, thanks for replying earlier. Hi Jo, thanks for the question. When submitting to such journals, you generally need to let them know what “image” or object you are referring to, but “explaining” the poem can come off as pompous and is probably not a good idea. However, you should always check out the guidelines of each individual journal to which you are submitting, since many have unique requirements. Whether or not they will use said image is up to the journal in question, and, again, it’s best to contact them and read their guidelines in advance. The same goes with the “chant” you mentioned; contact the journal in some way first and ask in advance (even a simple e-mail will do). Some journals will have no problem with references to other works, while others may have strict guidelines when it comes to including outside sections. Hope this helped, and keep writing! I have some poetry I’d like to submit to a journal. One of the poems is an ekphrasis. Another is inspired by an image. I understand that when I submit I don’t ‘explain’ the poem but do I mention the images that they relate to? If they publish the poems will they be able to use the images or will that infringe copyright? Also, the ekphrasis uses a chant (not written by me) within it. Do I tell the publisher that? Will they be able to use it or does it infringe copyright? Omar, it’s very realistic! Most journals and editors work online now, and you can easily contact or submit your work to them through e-mail. Journals rarely limit submissions based on location (some college presses, for example, may only take work from their respective states), but it is always good to check out your desired journal’s website first and thoroughly read the guidelines available. How realistic is it for a young poet outside US, in Africa precisely, to have his poems published in one of the journals you talked about. If yes, what are the procedures. You ask: QUESTION: Mainstream readers tend to shy away from poetry books. Have you ever purchased a collection of poems by a single author? Leave the name of the book as a comment! New and Collected Poems, Clive Wilmer. LeeAnn, thanks for the question! Generally, it’s best to submit your poems individually first to gain some publication credits. The more individual publication credits you have under your belt, the more likely a poetry book editor will publish the collection as a whole. Is it better to wait and publish all of your poetry at the same time, or slowly select a few choices to have individually published to get your work out there? How To Submit Poems To Literary Journals And Magazines: http://www.writersrelief.com/blog/2010/01/how-to-submit-poems-to-literary-journals-and-magazines/. Also, look into Writer’s Relief. We’ve been helping poets and writers get published in literary magazines since 1994! We have a service for every budget and can take the submission process off your hands with careful, personalized targeting. hello, what would be the best way to go about getting some of my work published in literary journals? Dear Martin, The first step–if you’re looking for a traditional publisher (that you don’t have to pay)–is to get many of your individual poems published in literary journals. Once you have some publication credits you can start thinking about a collection. There are two ways to proceed. Or, you can investigate Writer’s Relief services to see if they are right for you. We research and target the literary journals that are best-suited for a particular writer’s work. Full Service clients (writers who take advantage of our best service) are accepted by invitation only, but A La Carte clients don’t need to be approved by the Review Board. We help writers submit their work for publication. I have written approximately 100 poems that are primarily a narrative of personal experiences and cynical insights/humor. I think they would be of interest to the right publisher but I have no idea of how to go about locating that person. I’d greatly appreciate any information you may have that might steer me in the right direction. Sure! Check out this article! Can you say more about approaching small presses and universitites with a book of poems? How do I find who is interested in looking at poetry manuscripts? Why was everything in quadruplicate? Great questions. A chapbook of poems is essentially just a small book of poetry (as opposed to a longer collection of poems). The ISBN number is the International Standard Book Number: it’s the identifying number for your book and is accompanied by a bar code. Perhaps we might offer a bit of advice? Before you try publishing a poetry book, you may want to have some of your individual poems published in literary journals. This will help build up your publishing bio and perhaps give you an edge when you’re trying to find a poetry book publisher. Can someone tell me briefly what a “chapbook” is? Also, what is an ISBN number in reference to self publishing? Is that similar to a copyright? I am not new to poetry writing, but tottaly new at trying to publish. Horace, You will need to speak to your specific publisher about their policies on ISBN numbers. Generally speaking, self-publishing does give you more control over your work than traditional publishing. I am interested in self publishing a poetry book which has 50% photography. I was told that if I wanted to retain full control of my book, it is best to obtain my own ISBN #. Is that correct? I know that most printers prefer to use their own ISBN #’s which makes sense for them, but could I find a printer who would permit me to use my own ISBN#?